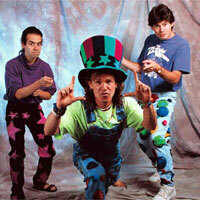 About The Artist: “The Beatles of Kids’ Music” – are what the Zucchini Brothers, Jack, Steve and Sam are often called. “Words of Wisdom Set to Foot-tapping Music” – are what the Zucchini Brothers deliver. This band of brothers: Jack on Guitar, Steve on Keyboards, Sam on Drums (each his own character, all of whom sing) offers up a musical stir-fry of styles. You never know just what these three zany guys will do. But one thing’s for sure, once you’ve seen ’em – you won’t forget ’em…100% Healthy…100% Fun!!! Originally from Saratoga Springs, New York, but now living in a clubhouse in ZucchiniLand, the Zucchini Brothers are well-renowned for their concerts in schools, theaters and festivals throughout the country, as well as their internationally syndicated weekly radio show “The Zucchini Brothers, Live! at the Clubhouse.” Winners of the NAPPA Gold Award and the Parents’ Choice Gold Award, the Zucchini Brothers have received critical acclaim for their albums “In Your Garden,” “Live! At The Clubhouse,” “Safe & Sound,” and their collection of “Music Videos.” In addition to producing their own radio show, the Zucchini Brothers make numerous television appearances, and their CDs are played on radio stations throughout the world. “Zucchini” music bridges the musical gap between kids and adults, appealing to people of all ages.